The One Club for Art and Copy is a non-profit organization founded in 1975 to recognize and promote creative excellence in advertising. Their annual awards show presents Gold, Silver and Bronze Pencils as awards. 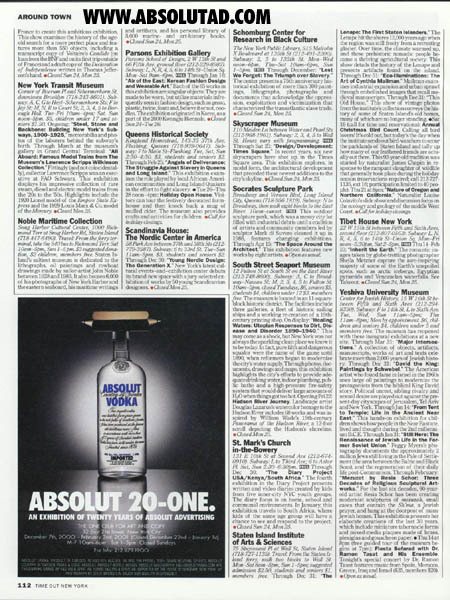 Photographed by Steve Bronstein, this �2000 ad shows an Absolut Vodka bottle in the typical white spotlight against a black background on a shiny surface. Atop the bottle is a small, dual pointed gold pencil, representing both the One Show awards and the 20 year continuing excellence of the Absolut product.